The Jeep Grand Cherokee is a popular and award-winning midsize SUV, so it’s not surprising the 2017 model is a standout among its competitors. Renowned for its versatility, the 2017 Jeep Grand Cherokee handily takes on urban roads and open highways, offering a comfortable, smooth ride in various settings. In addition, Jeep offers the Grand Cherokee at a variety of price points, making it accessible to budget-conscious shoppers. Whether you want affordability or all the best features, you can find a Jeep Grand Cherokee trim to meet your needs. With dual-zone climate control, the Laredo has an attractive price of $30,295**. Exterior chrome accents and remote start come on the Limited for $37,895**. 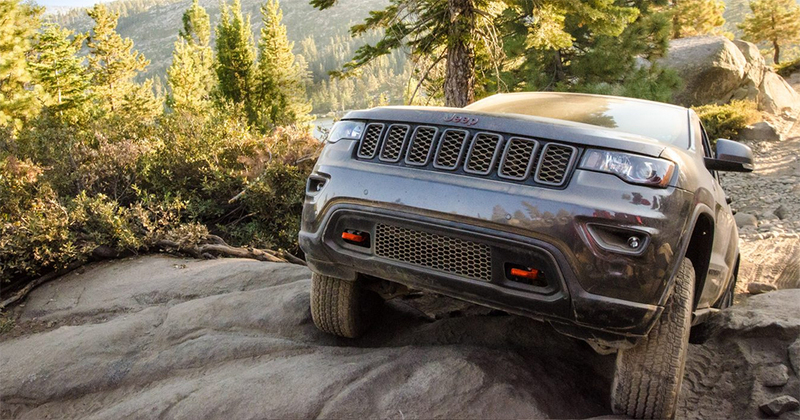 For superior off-roading capability, opt for the Trailhawk at $42,995**. With added exterior and cabin features, the Overland has an MSRP of $44,695**. As the most premium trim, the Summit’s price tag is $50,395**. 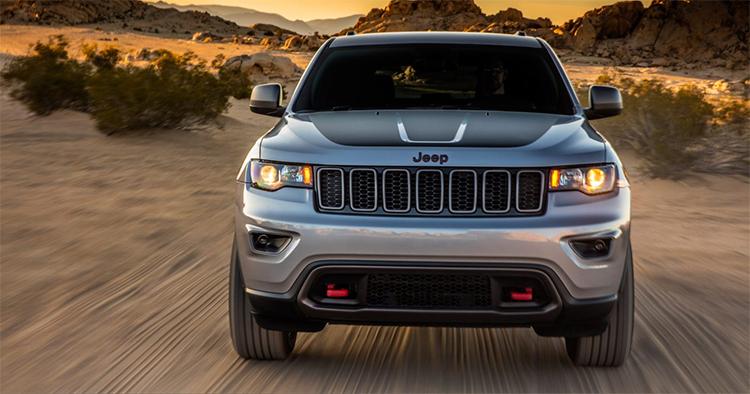 The signature Jeep grille serves as the centerpiece of the Grand Cherokee’s front fascia. From the side, the SUV has a boxy shape. 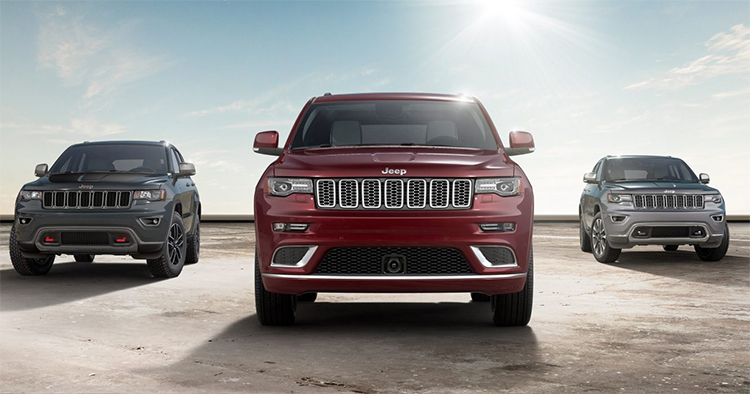 Contemporary accents and sculpted lines on the side create a bold look for the Grand Cherokee. Wheel style and size vary between trims with wheel sizes ranging from 17 to 20 inches. For the base Laredo, there’s only one available engine: the 3.6-liter V-6. This powertrain cranks out 295 horsepower with 260 pound-feet of torque. While the V-6 serves as the standard engine for all Grand Cherokees, the trims above the Laredo have two optional engines. Drivers can opt for either a 5.7-liter engine with an output of 360 horsepower and 390 pound-feet of torque or a 3-liter turbocharged diesel V-6 that churns out 240 horsepower and 420 pound-feet of torque. 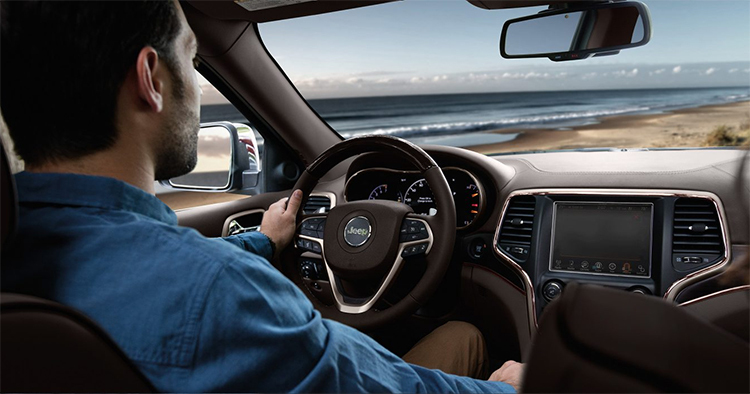 All of the Grand Cherokee engines are paired with an eight-speed automatic transmission. Those who yearn for powerful acceleration need the V-6 engine that runs on gasoline. Though the turbodiesel brings plenty of horsepower, its biggest advantages are reduced fuel consumption and exceptional towing capacity of 7,400 pounds. Any driver who craves a capable vehicle for off-roading should take a close look at the Trailhawk. With its unique tuning, suspension, off-road tires, and underbody skid plates, the four-wheel drive Trailhawk has all the features and equipment you need to tackle the trail. On upper trims, the ride is especially quiet thanks to an active noise-canceling system and noise-dampening acoustic glass. A roomy cabin invites you to sit back and relax. 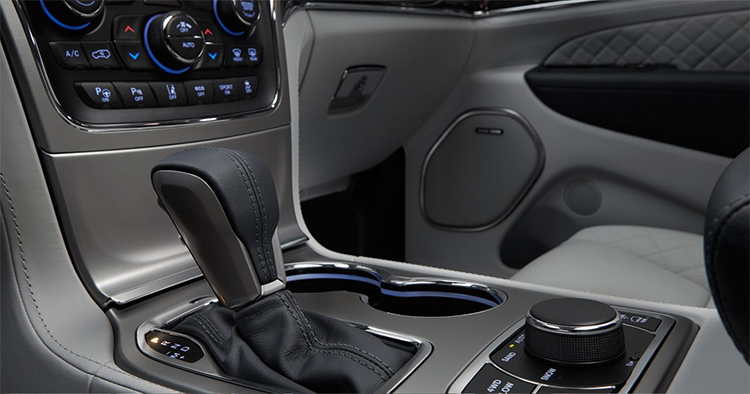 With the Laredo, you get Bluetooth technology, a 5-inch display, and an auxiliary audio jack. The touch screen increases to 8.4 inches on the Trailhawk and higher trims. Not only do the upper trims have a sizeable screen, but they also come with voice command features and a navigation system. Behind the back seats, there’s 36.3 cubic feet for storage. If you flatten the back seats, you expand the cargo space to 68.3 cubic feet. With air bags, head restraints, a rearview camera, and anti-lock brakes, the 2017 Grand Cherokee has all the standard safety gear. Higher trims offer the added protection of features such as blind-spot alerts, lane departure warnings, and forward collision mitigation. Schedule a test drive today to get behing the wheel of the new 2017 Jeep Grand Cherokee!